Shares in the small- and mid-cap segments were on fire on Tuesday, with one of the gauges posting its biggest single-day jump in nearly five months. The Nifty Smallcap 100 soared 3.9 per cent, the most since October 10, while the Nifty Midcap 100 rose 2.4 per cent, the highest since December 12. In comparison, the benchmark Nifty50 gained 1.1 per cent to close at 10,987. The Sensex rallied 379 points, or 1.05 per cent, to close at 36,442. Experts said investors lapped up shares in the broader market, where valuations had turned attractive after a year of sharp underperformance. Easing cross-border tensions also helped offset the move by the US administration to terminate trade benefits on Indian imports. 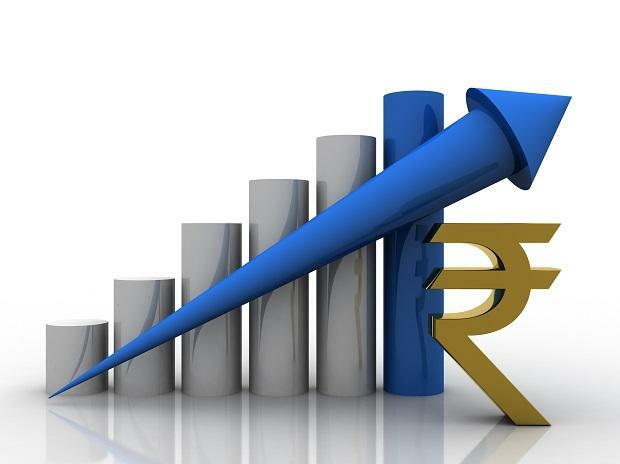 The sharp rally in domestic markets took place despite mixed global cues. However, Indian markets were shut on Monday, when most global markets had rallied on the back of the US and China inching closer to a trade deal. “From a valuation perspective, large-caps are highly valued. There is an opportunity in the high-quality small- and mid-cap segments. I don’t know how long it will continue, but we have seen optimism emerge towards this segment,” said B Gopkumar, CEO (broking and distribution business) of Reliance Capital. In the past one year, the Nifty Smallcap 100 index has declined 24 per cent, while the Nifty Midcap 100 index has fallen 11 per cent, even as the Nifty has gained 5.1 per cent. Experts said that a year ago, the price-to-earnings (P/E) multiples for smaller companies had climbed to historic highs. The subsequent correction was inevitable and necessary for normalisation of valuations, according to them. The mid- and small-cap indices had a dream run between January 2017 and January 2018 — zooming 48 per cent and 56 per cent, respectively. The gains were fuelled by easy liquidity and strong flows in mutual funds. The small- and mid-cap counters have been buzzing since the past two weeks. The Nifty Smallcap 100 has rallied nearly 12 per cent, against the Nifty’s gain of 3.3 per cent, in the past fortnight. “We believe the tide is about to turn and expect the small- and mid-cap space to outperform. Our conviction is anchored by attractive valuations, improving macro data, and improving sectoral trends. These, we believe, point to an imminent bounce-back,” said Edelweiss in a note to investors. 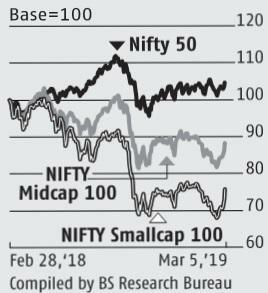 “Mid- and small-caps have outperformed after one year of underperformance as investors’ strategy has changed from sell-on-rally to buy-on-dips, due to attractive valuations,” added Vinod Nair, head of research at Geojit Financial Services. Both domestic as well as foreign investors were seen buying shares aggressively on Tuesday. According to provisional data, foreign institutional investors bought shares worth Rs 752 crore, while domestic institutions bought shares worth another Rs 581 crore, which led to the boost in market momentum. Market breadth was strong on Tuesday, with 2,120 stocks advancing and only 570 declining on the BSE. Further, all 19 sectoral indices, with the exception of the BSE IT index, ended with gains. Automobile, banking, and commodity stocks were the biggest gainers. Among Sensex components, Tata Motors gained the most at 7.7 per cent, followed by Hero MotoCorp at 4.6 per cent. Axis Bank and ONGC gained around 4 per cent each. Infosys fell the most, at 1.15 per cent.